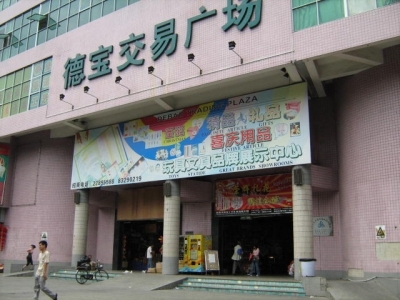 Guangzhou Debao Trade Wholesale Market is located in Guangzhou City, No. 190 East Germany, with a total construction area of ​​13,500 square meters, to operate fine gifts, festive supplies, toys and gifts based. Negative layer, the first and second floor has been opened, now open up the third tier brand display business center for the booming brands to provide an advanced trading platform. A nearly century-old dried seafood wholesale market commercial street, road to the sea from the exhibition is a German Chu Road section between the junction and extended to Yan Chai near the main road within the Long Beach street, build a large business seafood, dry goods, food, beverages and foodstuffs, groceries, small articles of daily and stationery, toys and other operators of thousands of brutal. As a German road commercial prosperity is well known universally known, it has been the numerous business battleground. With urban development, a German road facing the operators of the existing premises of the old town behind, behind the times demand. Government business operations to ensure that a German road to maintain prosperity and stability of the original transformation of the old city on the basis of the purpose of reconstruction to change the status quo through the transformation of greater prosperity for business and consumers to provide better environment and excellent facilities. According to the Guangzhou City Development Decade, a German road construction has been identified as key urban areas is one of ten professional street, square stone chamber in which the building will become a new tourist attractions shopping, to receive visitors at home and abroad. In recent years, gradually developed a German road safety billion square, a German Garden (Double Exchange Square), the International Toy City, sea treasure, great mountain and sea city and other large commercial buildings. This addition to the development of society with the other, so that the original has a strong business climate, a German road more prosperous, and the value of the property lot more time without both. Guangzhou Debao Trade Wholesale Market with City Commercial Street on a German road upgrading and meet the "change" coming! I will put one million yuan to upgrade the grade, specific measures are as follows: First, upgrade to the third floor toys, boutique, gifts, festive supplies, exhibition center, and decorated with the popular, new mode of operation, to tenants to provide a display , to discuss, the ideal office space. Second, the appearance will be rebuilt this year, including the removal of street shop facades, creating a transparent business environment, set a large number of outdoor billboards, to strengthen the mall business climate, the new look in your eyes. Third, new Double internal management restructuring has been to serve the first customer-first philosophy to provide you with an excellent business environment, go all out to welcome you, allowing you to participate in and supervise our work. Fourth, at a German road, Jinghai Road, Jiefang Road Interchange, from the Haizhu Square Station of Metro Line is two minutes away, strategic location and convenient transportation.